Black, decorative lantern. Opens under the lid. Metal base inside perfect for holding a pillar candle. Hook at top can be used for attaching to a shepherd hook. 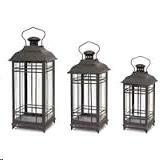 * Please call us with any questions about our lantern melrose 20 inch rentals in Columbia and Jefferson City MO.